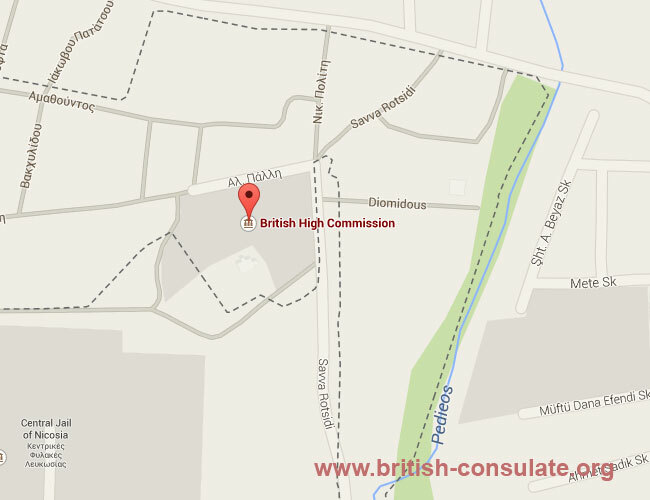 The British High Commissioner and British Embassy in Cyprus is located in Nicosia near the Central Jail of Nicosia. If you have questions about immigration to Britain, British visas then this is where it starts. Speak to the embassy staff on the telephone numbers and email address listed below for assistance. We have added the street address and also the operating hours of the Embassy in Cyprus. Search this website for more information on documents, marriage registration and applying to register a British national born abroad. There is also information about BNO renewal as well as passport renewal.